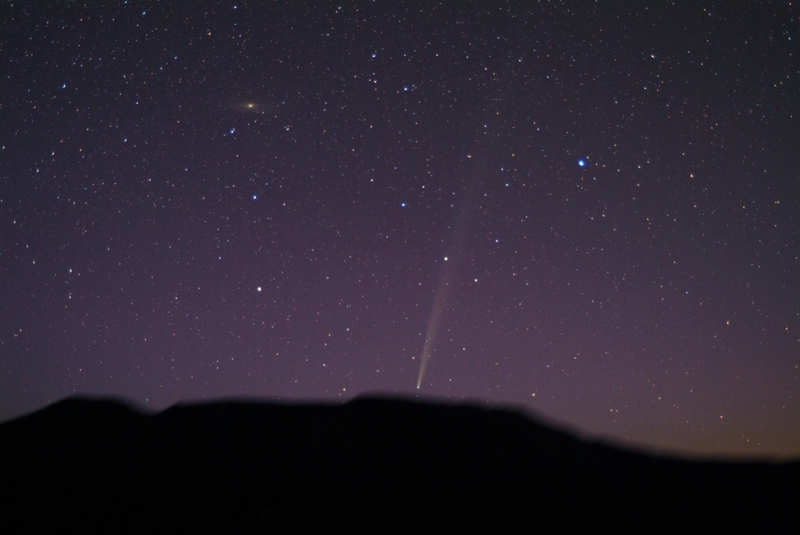 Explanation: Comet Bradfield has become quite a sight just before sunrise -- for those with binoculars or cameras. Although fading noticeably each day, a sky chart, a northern location, and some persistence will allow curious sky gazers to locate the cosmic snowball and its spectacular tail. One might call Bradfield a "camera" comet as its extended tail is too long for most telescopes but caught nicely by normal cameras capable of long exposures and set to rotate with the sky. Pictured above just yesterday, Comet C/2004 F4 (Bradfield) was caught as it rose on successive three-minute exposures above the Rocky Mountains near Yampa, Colorado, USA. Visible on the upper left as a bright fuzzy smudge is the Andromeda Galaxy (M31), far in the distance. Comet Bradfield was discovered only last month and was briefly visible to the unaided eye. It was imaged in spectacular fashion by the SOHO spacecraft as it rounded the Sun early last week.